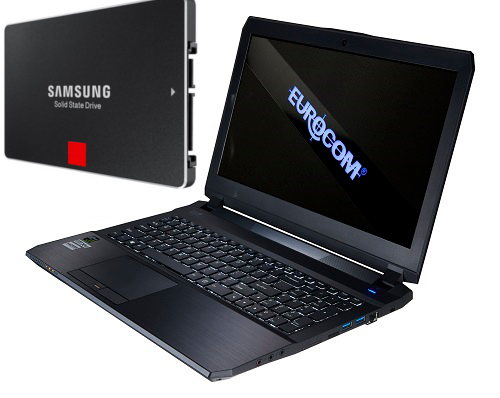 The EUROCOM M5 Pro can now be customized with 2 TB Samsung 850 Evo and 2 TB Samsung 850 Pro Solid State Storage Drives allowing the M5 Pro to support over 5TB of high performance SSD storage. The EUROCOM M5 Pro can now be built with NVIDIA GeForce GTX 980M, 970M or 965M graphics, Intel Core i7-4870HQ, I7-4720HQ or i7-4710HQ processors, up to 32 GB via four SODIMM, 15.6” FHD, 3K or 4K displays, Windows 7, 8, 10 or Ubuntu 14.04 LTS operating systems, and now up to two 2TB Samsung 850 Pro or 2 TB Samsung 850 Evo SSDs along with two M.2 SSDs. The EUROCOM M5 Pro is a lightweight 2.6kg laptop with superb performance. It is powered by the next generation of world's most powerful NVIDIA GeForce GTX 980M and 970M graphics and features a beautiful 4K, 3840-by-2160 pixels display. The EUROCOM M5 Pro supports both NVIDIA GeForce GTX 980M (4GB DDR5), GTX 970M (3GB DDR5), 965M (2GB DDR5) graphics for unbeatable performance, raw power and great battery life. The NVIDIA GeForce GTX 980M’s 1536 CUDA cores, running at 1038 MHz and 8 GB of GDDR5 memory running at 2500 MHz offers 50% faster performance than the previous generation NVIDIA GeForce GTX 880M. Experience great notebook graphics performance with next generation NVIDIA GeForce GTX 980M, 970M and 965M Maxwell graphics for advanced performance, unmatched power efficiency and cutting edge features.